Boutique luxury loungewear made in Los Angeles. BedHead Pajamas’ founder, Renee Claire, grew up in southern Ontario, Canada. After spending her formative years in cold winters sewing her own clothes, honing a sense of color and pattern and dreaming of a California lifestyle, she packed up her van with a few possessions and headed to Los Angeles to pursue her dream. BedHead is now sold in over 1,500 boutiques worldwide, renowned department stores including Neiman Marcus and Nordstrom, in the BedHead flagship store in West Hollywood, and on the BedHead website. P3 runs all aspects of BedHead Pajamas online business, most notably bringing the established brand an unprecedented online customer experience through its newly designed website while increasing customer acquisition and retention through paid media, email marketing and data-driven website optimization. 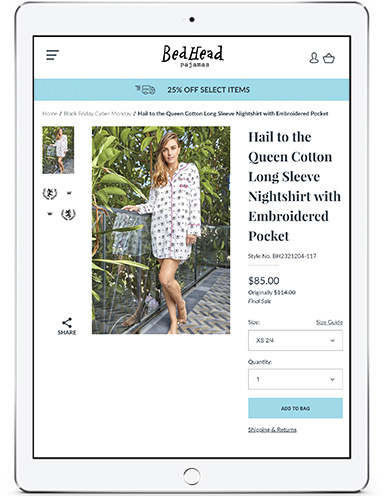 The results of our unwavering dedication to our clients is that P3 has elevated and modernized the user experience of Bedheadpjs.com through a exacting design process. P3 migrated BedHead Pajamas to Shopify Plus and automated many time-consuming manual tasks. 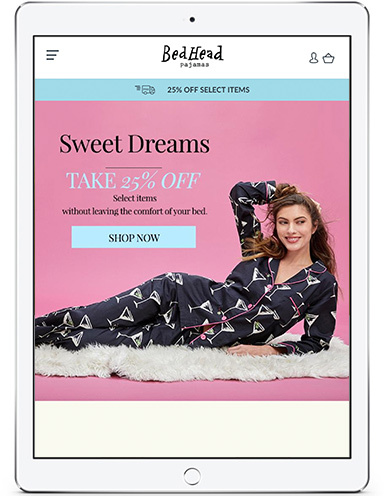 After relaunching the BedHead Pajamas website, P3 shifted focus to increasing customer retention and acquisition through paid media, email marketing and data-driven website optimization. Since working with P3, BedHead Pajamas has surpassed their growth targets while improving overall operational efficiency. This is all done while maintaining continuity with the brand’s long standing public image, which is carried through in every facet of their online identity.